I'm pretty sure most of us got into teaching because we love and care about kids. But when we teach hundreds (or even thousands) of students and you only see each one for 30 minutes every week (or two weeks.... or three....), it can be pretty hard to foster real relationships with our students! And let's not even get started on the fact that for those brief minutes that we see them, we're trying to cover so much content that there is very little, if any, time left to get to know the students. Today I want to try to unpack some of the factors that I believe have allowed me to better connect with my students despite those challenges. Now, I'll start off by saying that I am in a better position than many music teachers to make real relationships happen. I see my students 60 minutes total every 5 days (some once a week, some in 2 30-minute classes per week), and I teach just under 400 students in just one building. 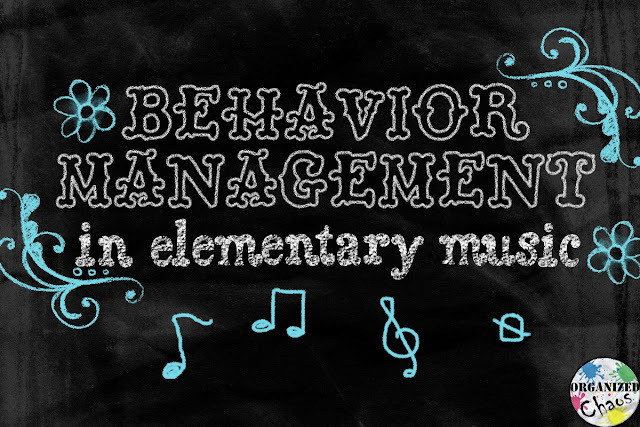 As I mentioned before, I know many music teachers (and other specialists) see each student far less than I! Still, I think these principles can be applied to any situation to, at the very least, improve relationships with students. I truly believe the biggest factor in deepening my relationships with my students has been my morning duty! I'm assigned to monitor the front entrance of the school as all of the students are arriving. This gives me the perfect opportunity to do something very important: make eye contact with as many students as possible. I try to say hello and make eye contact with as many students as I can each morning (and throughout the rest of the day), and I pay close attention to any students whose faces show some kind of emotion, whether it's good or bad. Sometimes a student is excited because it's their birthday or they lost a tooth last night. When I notice a student looking particularly happy or excited and I ask them how they're doing, they will often share what's on their mind. Sometimes though, a student is upset. Sometimes it's obvious, but I've noticed that this year, since I started being more conscious about making eye contact, I'm picking up on more students who are trying to act normal but, on closer inspection, show signs of being tired, stressed, sad, or even angry. When I can pick up on those changes in expression, I pull them aside to ask them what's going on. Sometimes they're sick, sometimes they miss their mom, but other times it's a much more serious issue. In any case, doing this consistently has been the biggest factor in deepening my relationships with my students. I have often learned really valuable information about a student's life outside of my classroom by going to other teachers and staff to talk about a student. I usually go find another teacher to talk to when a student does something out of character in class, but other times it's because I look back and realize there has been a pattern of gradual change over the last few weeks/ months, or because I noticed something was bothering a student but I either didn't have time to speak with them or when I asked, the student wasn't willing to talk. Not every student in the school is going to be comfortable sharing their deepest thoughts and feelings with me, but often their homeroom teacher, other specialists, psychologist, nurse, or even the school secretary will have noticed the same things I am, and can either tell me what the reason is, assure me that it's being dealt with, or they'll be more focused on the issue themselves because I brought it up. Usually I just stop by the teacher's room for a 5-minute conversation. That's all it takes, but it often makes a difference in being able to understand the bigger picture of what is going on in my students' lives! Although as specialists we have the disadvantage of seeing students for less time each week, we do have the advantage, in most cases, of seeing the same students for multiple years in a row. Now that I'm finishing my 4th year in my current school, I am finally starting to see the fruits of the little interactions I have been having with my students over the course of several years. 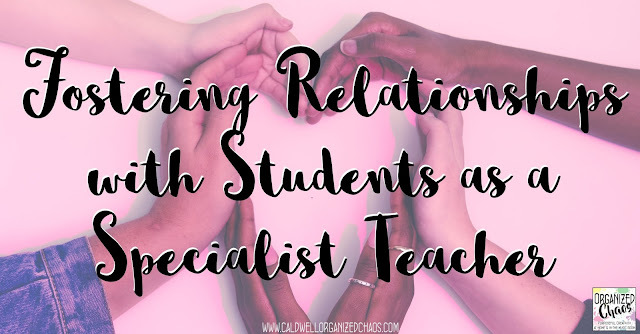 As specialists, the reality is we have to be more patient than other teachers as we foster relationships with our students. 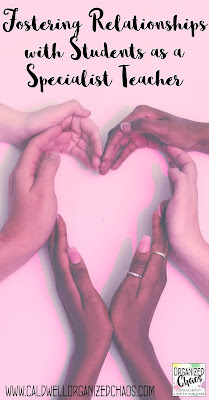 It may take longer, but we'll often be able to connect with students who may not find a connection with any other adult in the building! With these 3 components in place, I have seen exponential growth in my connection to my students this year. With one more week left of school and emotions running the gamut, I have students dropping into my room randomly throughout the day, just wanting to talk and hang out. It really does work, and I really do think that fostering those relationships is truly worthy of all the time and energy we have to give. These may seem like obvious, basic points, but how much thought and energy have you put into truly being conscious of each one? I hope you'll keep these thoughts in mind as you reflect on your previous school year and prepare for the next. 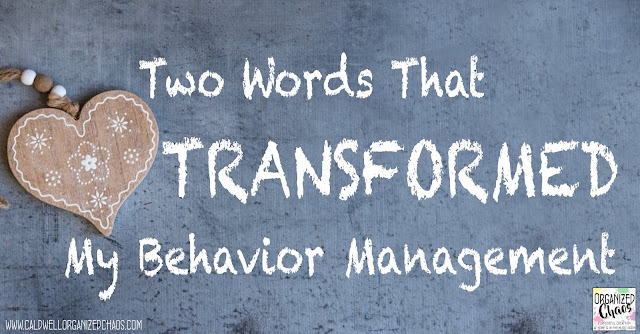 Want to read more of my thoughts on "behavior management"? How have you found ways to connect with your hundreds of students? Share your ideas in the comments below! And be sure to stay in touch by signing up for the Organized Chaos Newsletter right here. You'll get more ideas and resources sent straight to your inbox. Great blog post with such important points! Since I teach music on a cart, my main prep space is a closet located in a main hallway. Students pass by on their way to the bathrooms/water fountains and teachers pass by on their way to the copy room, which allows the opportunity for conversations that wouldn't otherwise occur. One of my 1st graders in particular caught on to my schedule this year and tends to ask for his water fountain drink during the time he knows I'll be at that closet. Our conversations are always brief, but he just loves that chance to touch base and share outside of music class time. Aww, those little moments can make all the difference sometimes! You are an inspiration, Danielle, and I know you are making a difference in so many of your students' lives! Thanks for sharing!